What Juniper lacks in size, she makes up for in heart. And her heart is dead-set on growing up and getting taller. She's tired of having to reach for the cookie jar or use a stepping stool for the toilet. Everything in Juniper's world seems to be made for adults. Ugh! Juniper is industrious, however, and builds several silly contraptions to help reach her goals. 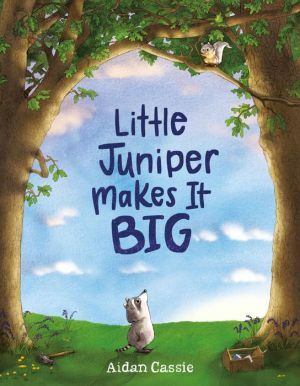 But it isn't until she makes a fun new friend at school, Clove, who is even smaller than Juniper, that she is able to see her world from a new perspective ― and appreciate all sizes, big or small. Aidan Cassie, the creator of Sterling, Best Dog Ever, employs her pitch-perfect humor and heartwarming illustrations here again to help little ones love themselves at any size.